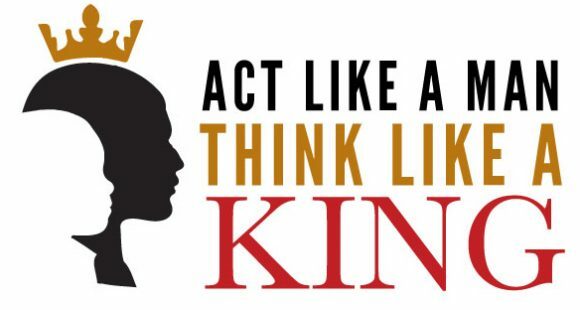 Act Like A Man, Think Like A King | New Growth Hair Magazine | We capture the culture of urban barbershops and beauty salons. Comedian Steve Harvey wrote a best-selling book entitled Act Like A Lady, Think Like A Man. The book was so well received that it became a script for two major motion pictures: Think Like A Man and Think Like A Man Too. In various interviews, Harvey said that he wrote the book to give women advice on men so that they would have success in relationships. But what about the guys? Don’t men need advice on how to achieve success in relationships? Since the release of the books and films, Harvey has failed to give men meaningful advice on manhood, fatherhood, and the role of men in community building. During the past thirty years, Western society has become a hypersexual environment that has encouraged men to think with their penises and to use their money to attract and control women. Recently, mainstream media and other powerful forces are suggesting that gender is a social construct, meaning that society has brainwashed people into thinking that they are either male or female. Currently, young boys and men are very confused about the definition of manhood and their purpose in society. In traditional African society, we had clear definitions of manhood. Between the ages of 13 and 30, young males went through a rites of passage, a process to transition young boys into responsible and productive members of society. Traditional African culture allowed boys the opportunity to learn, play, and explore while men had a responsibility to build, protect, and teach. Since the modern world is confused about the definition of manhood, I suggest that we resurrect and restore our ancestor’s definition of manhood. Due to their income, we have been convinced that actors, entertainers, sports stars, and dope boys are men. But according to our traditional African values, most of these athletes and entertainers are boys because they are still in the stage of playing and exploring. The majority of these males aren’t building, protecting, and teaching our community. Larry Johnson, former Charlotte Hornets and New York Knick star basketball player described his teammates as “rebellious slaves” and the following NBA season a white fan heckled Larry Johnson by yelling the following statement at him “You’re nothing but a $40 million slave.” Larry Johnson wasn’t the only entertainer to consider himself a high paid slave, Prince, the musical legend wrote “Slave” on his check to describe his contractual relationship with Warner Brothers Music Group. Through visual and musical mind control techniques, the entertainment industry has encouraged our boys and young men to become slaves in the prison industrial complex. Freeway Rick Ross, the notorious Los Angeles drug dealer said “Most black drug dealers don’t have a lot of money.” Many rappers emulate the drug dealer lifestyle and convince boys and young men that they are the definition of manhood only to lead them on a path toward prison. In summary, the group of people that our community admires are the antithesis of manhood and provide little or no measureable benefit to our people. Kings are generous noble men of superior character who aren’t interested in childish games. Kings are men who have discarded their childish ways and completed their journey of self-discovery which provides them with clarity about their life purpose. Kings are concerned about their legacy, their community, and honoring their ancestors. Kings aren’t interested in using women as tools of sexual pleasure because they view their Queens as co-rulers who uses their intuition to help protect their kingdom. Kings are long-term thinkers who plan for the next seven generations. Now is the time that we begin to provide a clear definition of manhood and encourage our males to embrace their community responsibilities. We must change our collective minds to begin acting like men and thinking like kings.